This pizza tastes as terrific as it looks and you just might be fooled at how easy it is! We are big fans of grilled pizza with homemade dough, but shortcuts can also produce amazing results. Start with a whole wheat pita, some leftover broccoli, and a few items from the deli counter and you can have a satisfying weeknight meal or special weekend lunch in a flash. Place pita on a baking sheet. 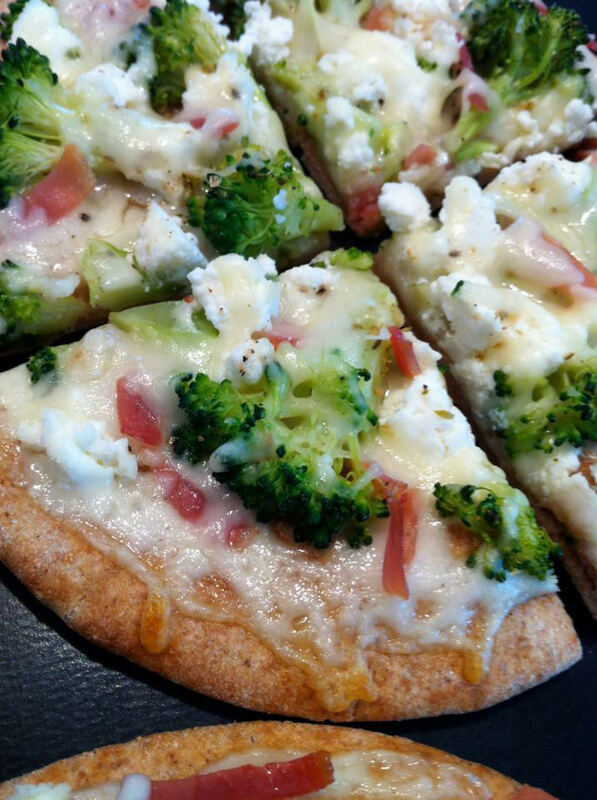 Spread provolone over pita, then prosciutto and broccoli. Drop ricotta in globs about the size of a big blueberry all over pita. (Use two teaspoons or your fingers.) Sprinkle mozzarella, then oregano, salt and pepper over top. Bake at 425 degrees for 5 minutes, or until cheese is melted. Can use toaster oven. Simply adjust cooking time as necessary since all toasters may not cook consistently. If available, fresh ricotta is delicious.